Pressure-sensitive tape, known also in various countries as PSA tape, adhesive tape, self-stick tape, sticky tape, or just tape, is an adhesive tape that will stick with application of pressure, without the need for a solvent (such as water) or heat for activation. It can be used in the home, office, industry, and institutions for a wide variety of purposes. It will stick without the need for a solvent such as heat or water for activation. By contrast a "gummed" or "water activated" adhesive tape requires warm water for activation. Likewise, some "heat activated" tapes require heat. Pressure-sensitive adhesive was first developed in 1845 by Dr. Horace Day, a surgeon. Commercial tapes were introduced in the early twentieth century. Hundreds of patents have since been published on a wide variety of formulations and constructions. Adhesive transfer tape does not have a backing material. Instead, adhesive is on a double-coated release liner for winding on a roll. Sometimes the adhesive is sandwiched between two liners. Archival tape is similar to transparent office tape, with low-acid adhesives that will not degrade surfaces they are applied to, protecting documents from damage during long-term storage. Box-sealing tape (also "packing tape"; "parcel tape", UK) is a type of packaging tape which is clear or opaque, and used for closing packages for shipment. It is usually two inches (48 mm) or three inches (72 mm) wide and is made of a polypropylene or polyester backing. Drafting tape is similar to masking tape, but with lower tack adhesive so that it may be removed without damaging or leaving residue on paper or other delicate surfaces, and also has pH maintained at 7 so as not to damage the substrate. Duct tape usually has a plastic-coated fabric backing and a strong adhesive. Double-sided tape has adhesive on both sides of a backing material, for attaching two surfaces together. 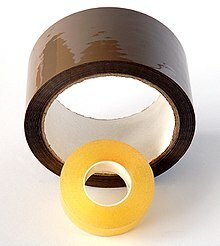 Electrical tape (or insulating tape) stretches to conform to irregular objects, and is made of materials like vinyl that do not conduct electricity. Filament tape or "strapping tape" has filaments (usually fiberglass) embedded into the adhesive for extra strength. Gaffer tape (or simply "gaff tape") is normally based on a heavy fabric or plastic tape. Hockey tape or "friction tape" is a somewhat rough cloth tape used for grip on hockey and lacrosse sticks. Masking tape is used to cover areas that should not be painted. It usually has a paper backing and an adhesive designed to be removed from surfaces (within a limited time). Spike tape is a thinner version of gaffer tape that is usually brightly colored. It is used to mark places of furniture or actors on a stage. Surgical tape is an adhesive bandage used to hold a dressing on a wound. Transparent office tape (branded Sellotape, Scotch Tape, Duck, Tesa, LePage's, Texcel, etc.) has a transparent film backing and an acrylic or synthetic rubber–based adhesive. It is used for sealing envelopes, repairing torn paper products, general holding, etc. When it has a matte finish, it is called "invisible tape". Backing. The primary component of tape upon which an adhesive is applied. Examples are cloth, paper, metal foil, plastic film, etc. Conformability. Ability of a tape to make total contact with a rough or uneven surface. Creped. Paper that has small "folds" to provide stretchability and conformability. Double-coated, or two-sided tape. Pressure-sensitive tape with adhesive on both sides of the carrier material. Gapping. Openings between layers of tape within a roll. Release coating. A very thin coating applied to the impervious tape backing so as to allow the tape to be unwound at a controlled level. Substrate. The material to which the PSA tape must adhere. Tack. The sticky feel of the tape. It is the initial adhesion without rub-down. Telescoping. A sideways sliding of the tape layers, one over the other, so that the roll looks like a funnel or telescope. Unwind. The force to remove or unwind the tape from a roll. ASTM: ASTM International has several Technical Committees which write standards related to pressure-sensitive tape. ASTM International has dozens of standards related to pressure-sensitive tape. Some of them are for general types of PSA tape; others are for specific types. For example, ASTM D1000 has test methods for electrical tapes. There are ASTM specifications for many tapes including D2301 for vinyl electrical tape, D5486 for box-sealing tape, etc. Several of the ASTM test methods are coordinated with PSTC, other trade associations, and other international organizations. Life cycle assessments of the tape and the item being taped are useful to identify and improve possible environmental effects. For example, there may be instances where the use of a PSA tape, compared to an alternative solution, improves the overall environmental impact, or vice versa. Reuse or recycling are sometimes aided by a tape being removable from a surface. If a tape remains on an item during recycling, a tape should be chosen which does not hinder the recyclability of the item. For example, when taped corrugated boxes are recycled, film-backed box-sealing tapes do not hinder box recycling; the PSA adhesive stays with the backing and is easily removed. ^ Jensen, Timothy (September 1992). "PSA Tapes Offer Environmental Advantages in Packaging". Adhesives Age. Archived from the original on 2010-06-25. Retrieved 2007-11-06. ^ Jensen, Timothy (April 1999). "Packaging Tapes:To Recycle of Not". Adhesives and Sealants Council. Archived from the original on 2007-11-09. Retrieved 2007-11-06. ^ Gruenewald, L. E.; Sheehan, R. L. (1997). "Consider box closures when considering recycling". J. Applied Manufacturing Systems. St Thomas Technology Press. 9 (1): 27–29. ISSN 0899-0956. This page was last edited on 4 April 2019, at 03:04 (UTC).